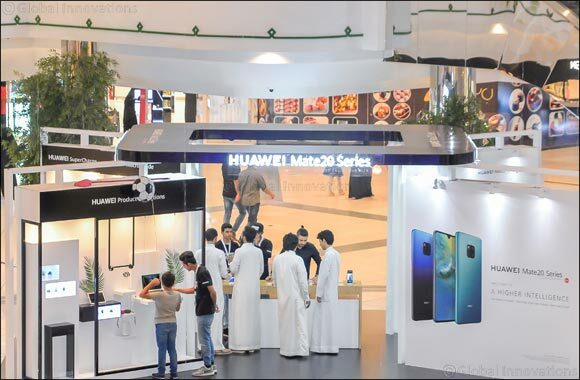 Riyadh, Saudi Arabia November 14, 2018: In order to provide more live experiences before purchasing, Huawei Saudi Arabia went around between major cities in the Kingdom showcasing the latest products of its new HUAWEI Mate20 Series. Huawei plans to bring the phone closer to its customers so they can use it through mobile platforms during the month of November, which include retail outlets such as the Red Sea Mall in Jeddah, Granada Mall in Riyadh and Al Rashid Mall in Dammam. Mr. Pablo Ning, Vice President of Huawei Saudi Arabia, said: 'Customers are looking for technical details through media or online. However, it is very rare to see them use the device, test it and have a full live experience prior to making their purchasing decision. We have provided a pre-purchase experience to introduce customers to the latest features and technologies in the HUAWEI Mate20 Series, as well as educate them in how to take advantage of such features regardless of their different needs and ways of using the smartphone; whether it is for education, entertainment or even daily usage'. Huawei aims to have the campaign as an introduction to the all-new HUAWEI Mate20 Series and present it to the public in Huawei's mobile platforms, highlighting the revolutionary AI applications, the distinctive camera and its unique features, supported by Kirin 980 processor. The System on a chip at the core of smartphones has a determining factor in a device’s performance and efficiency. Manufactured with the cutting-edge 7 nanometer technology process, the SoC fits 6.9 billion transistors within a die the size of a fingernail. Compared to Kirin 970, the latest chipset is equipped with CPU that is 75 percent more powerful, GPU that is 46 percent more powerful and NPU that is 226 percent more powerful. Visitors can also know more about HUAWEI Mate20 Series camera were the HUAWEI Mate20 Pro is equipped with a 40 MegaPixel main camera, a 20 MegaPixel ultra wide-angle camera, and an 8 MegaPixel telephoto camera. Together, the trio of lenses support a wide range of focal lengths enabling it to mimic the results from professional cameras. This wider perspective creates a sense of spaciousness and a three-dimensional effect to the images. The new camera system also supports macro distance, which produces crisp images of objects that are laces as closed as 2.5 cm from the lens. The HUAWEI Mate20 Series also features an Artificial Intelligence Portrait Color video mode. Using AI, the HUAWEI Mate20 Series can isolate human subjects and desaturate the colors around them to dramatically highlight the person. AI Spotlight Reel identifies clips with a shared theme and auto-generates a montage, made entirely of highlights. It automatically creates 10-second edited clips. Visitors can learn about the new features of the new camera, which include master AI technology, professional artificial intelligence skills, and HUAWEI AIS technology, supported by artificial intelligence for image stabilization. Visitors will also be able to experience the groundbreaking Reverse Charging that will be capable to transforming the phone into a wireless charging unit to charge other phones. The HUAWEI Mate20 Series also features groundbreaking improvement on battery life. It houses a large, high-density 4200mAh battery for HUAWEI Mate20 Pro and supports 40W HUAWEI SuperCharge, which gives the device 70 percent charge in 30 minutes. The safety of the technology is certified by TÜV Rheinland. On the other hand, it has the world’s fastest 15W wireless quick charge. Huawei offers the opportunity for a real, full live experience of the revolutionary technologies featured in HUAWEI Mate20 Series, through the allocation of the different shopping malls within its mobile platforms until the end of November.